There are 19 Assisted Living Facilities in the Worcester area, with 7 in Worcester and 12 nearby. The average cost of assisted living in Worcester is $6,225 per month. This is higher than the national median of $3,346. Cheaper nearby regions include Auburn with an average starting cost of $3,495. To help you with your search, browse the 164 reviews below for assisted living facilities in Worcester. On average, consumers rate assisted living in Worcester 4.8 out of 5 stars. Better rated regions include Woonsocket with an average rating of 5.0 out of 5 stars. Caring.com has helped 5 families in Worcester find high-quality senior care. To speak with one of our Family Advisors about assisted living options and costs in Worcester, call (855) 863-8283. "The Heart of the Commonwealth," Worcester, Mass., is a mid-sized city with a population of over 185,000. Approximately 20 percent are college students at one of the nine colleges in the city while seniors ages 65 and over make up over 12 percent of the city's residents. Worcester is home to seven assisted living residences, as assisted living facilities are called in Massachusetts, with another 27 in nearby communities, including Framingham, Shrewsbury and Auburn. In these facilities, aging adults can receive personal care services in addition to room and board. Personal care services typically include assistance with grooming, dressing, bathing and medication management. 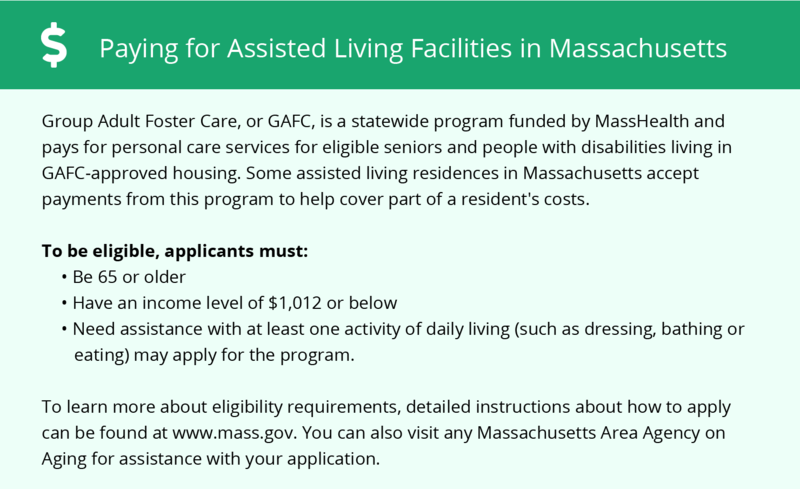 Within the state of Massachusetts, the Executive Office of Elder Affairs regulates assisted living residences. • Worcester has a long history as a cultural center for Central Massachusetts. Locals go to The Hanover Theatre to see touring Broadway productions and concerts, while the Worcester Art Museum serves as the flagship for the local arts community. The arts and cultural offerings available in Boston are about an hour's drive away. • The entire state of Massachusetts is a member of the AARP Network of Age-Friendly Communities, meaning that its elected leadership “has made the commitment to actively work toward making their town, city or county a great place for people of all ages,” according to AARP. • Worcester's weather is comparatively moderate thanks to the mountains to the west, which protect the city against storm systems. Residents can expect cold snaps in the winter, with winter lows averaging 17 degrees Fahrenheit, and summertime thunderstorms. • The Worcester area is home to world-class medical facilities, including UMass Memorial Medical Center, in the event of medical emergencies or illness. • Even though Worcester is less than 50 miles from Boston, where certain neighborhoods have a cost of living double the national average, Worcester's cost of living sits at only 6.8 percent above the national average. • Worcester has an array of community resources for seniors, including Elder Services of Worcester Area, an organization that assists seniors with money management and protective services, as well as a dedicated senior center and another five senior dining centers. Assisted Living costs in Worcester start around $6,225 per month on average, while the nationwide average cost of assisted living is $4,000 per month, according to the latest figures from Genworth’s Cost of Care Survey. It’s important to note that assisted living rates in Worcester and the surrounding suburbs can vary widely based on factors such as location, the level of care needed, apartment size and the types of amenities offered at each community. 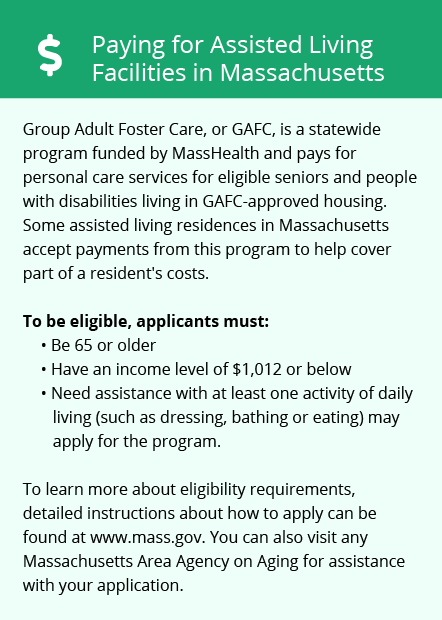 Several sources of financial assistance are available to eligible seniors in Worcester, including Senior Care Options through Medicaid and Mass-Health, and Supplemental Security Income Category G, which is accessible through the Social Security Administration. To see a list of free assisted living resources in Worcester, please visit our Assisted Living in Massachusetts page. Worcester-area assisted living communities must adhere to the comprehensive set of state laws and regulations that all assisted living communities in Massachusetts are required to follow. Visit our Assisted Living in Massachusetts page for more information about these laws.